I was watching the weather report on TV last night and apparently this February is the warmest on record for the UK – quite a difference from last year when the “Beast from the East” brought snow and the country to a standstill – and strangely unsettling in a country that expects the winter weather to go on for another few months yet. Meterological Spring starts tomorrow on 1 March and already the plants and trees are waking up; the daffodils are out in the garden; the catkins are showing their furry coats on the willow trees and leaves and buds are sprouting everywhere. On the face of it, a week of warm weather timed just right for the school holidays is about as good as it gets at this time of year, but a whole month of unseasonably warm weather – or unseasonably cold or ridiculously hot depending on where you are in the world – isn’t necessarily good news at all. Here in the UK we seem to have bypassed winter altogether (apart from a few cold weeks); elsewhere the winter has served a double dose of cold winds and snow, or the summer sun has turned the landscape into a tinder box ready to ignite at the slightest spark. It appears that global warming is well and truly here. It's half term here in our part of the world which means lazy mornings and small daughter attempting to eat biscuits for breakfast ... but it's also been a super-exciting few days! 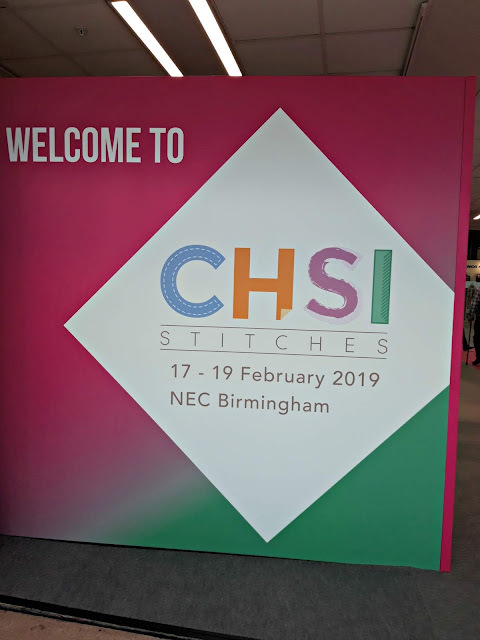 On Sunday, it was the first day of the CHSI Stitches trade show and I headed down to the NEC exhibition centre in Birmingham to join West Yorkshire Spinners on their stand for the launch of the Winwick Mum Collection yarn. Oh my life! 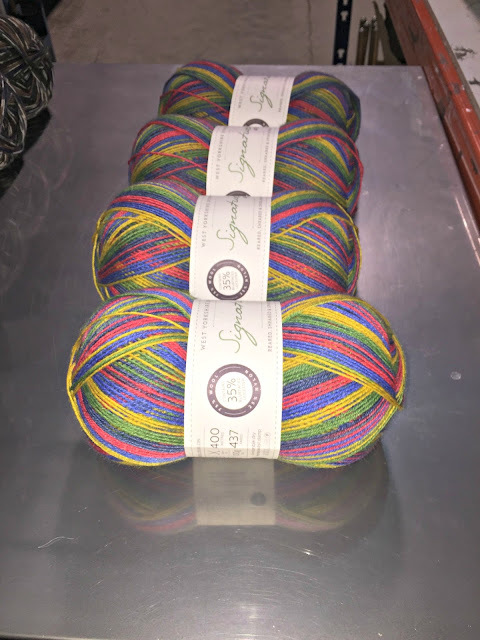 It sounds crazy but even though I've chosen the colours, seen the the yarn being created, designed the patterns and knitted the socks, it wasn't until I saw them and the balls of yarn on display that it finally hit me that this is really happening! It's really happening!! The West Yorkshire Spinners stand looked amazing - a beacon of rainbow colours in the exhibition hall - and it was amazing to be part of the team for the day. 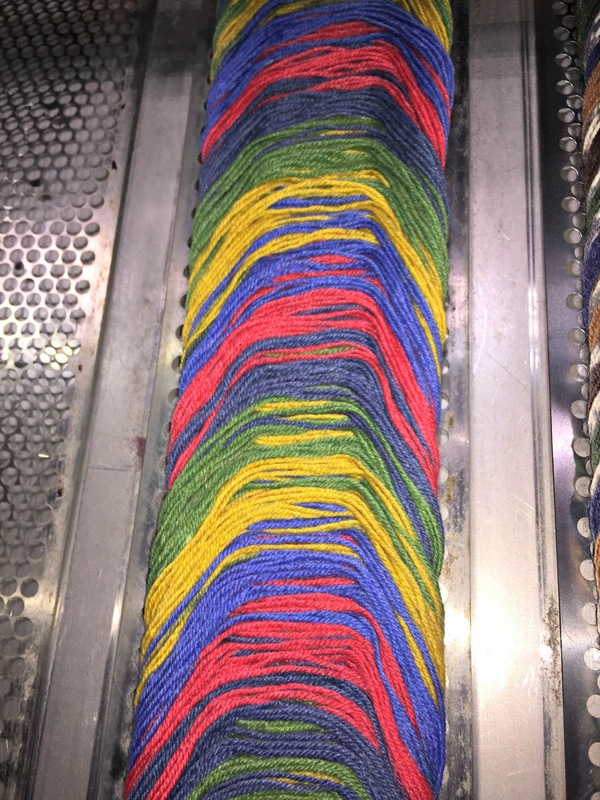 My yarns (my yarns!) and the sample socks were beautifully displayed and some of them even had pride of place in the centre of the stand. It was an incredible moment to see them there! I got to speak to lots of yarn shop owners which is always a lovely thing to do, I got to admire socks (lots of socks in progress in bags, something of which I heartily approve) and there were even a few trouser leg lifts which I think may becoming a Winwick Mum thing. I got to say "yes, that's my yarn" more times than I had ever imagined - and it felt great! 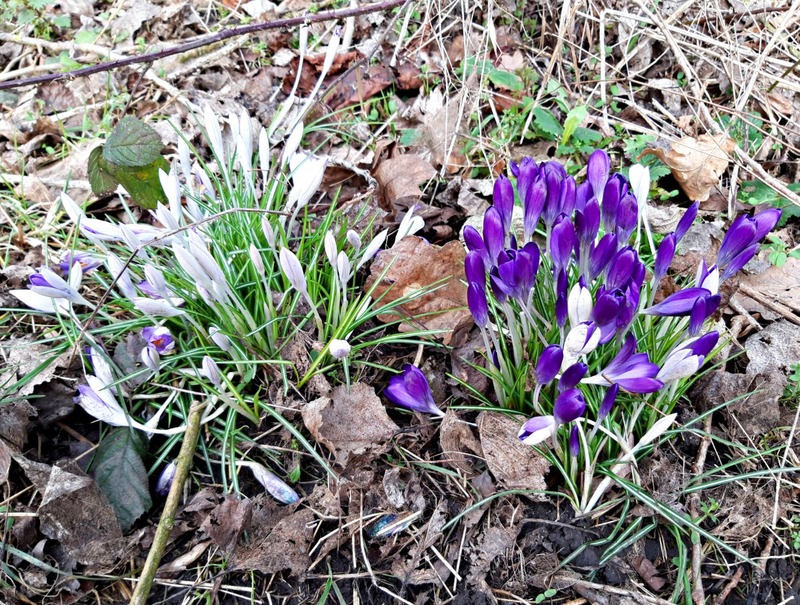 There are still a few weeks until the Vernal (Spring) Equinox on 20 March (meterological Spring starts on 1 March) but already I'm noticing signs of Spring when I'm out with the dog. I'm trying not to think that the Winter is over already because we all know that the weather ignores the seasons and does what it pleases, and it's entirely likely there'll be snow in March (it happened last year! ), but it is lovely to see the flowers appearing. 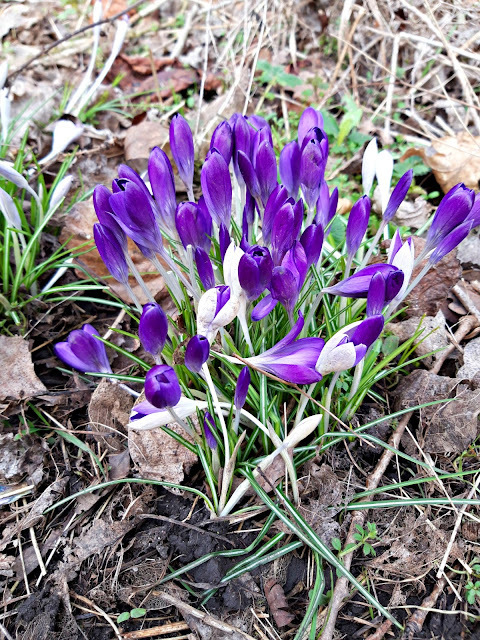 At Culcheth Linear Park, there are crocuses in various shades of purple. Wow! 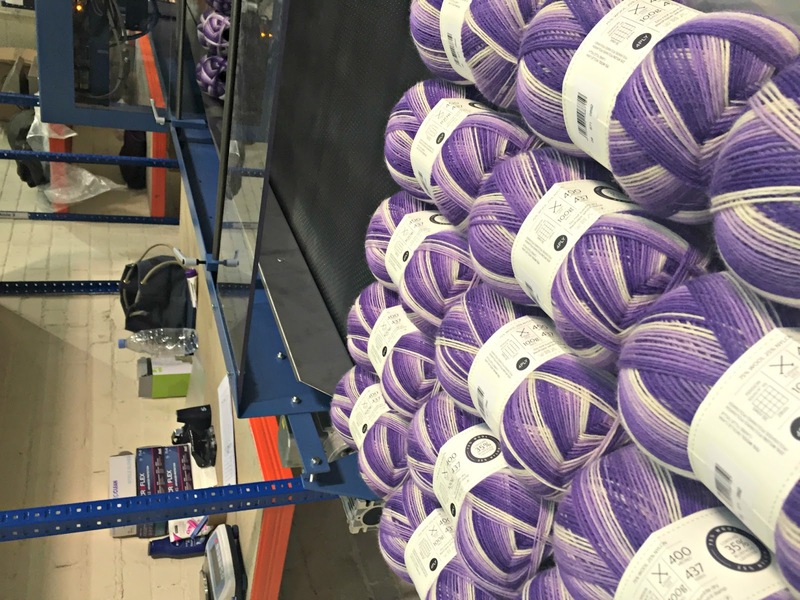 To say that I am bowled over by your reactions to the Winwick Mum yarn colours is an understatement! Thank you so much for all your lovely comments, I am so thrilled that it looks like yarn you would like to knit! This isn't my yarn, it's going to be grey sock yarn - you can see the white nylon added for strength and right at the back is a bale of black fleece which will be blended in with the cream to produce a pale grey. 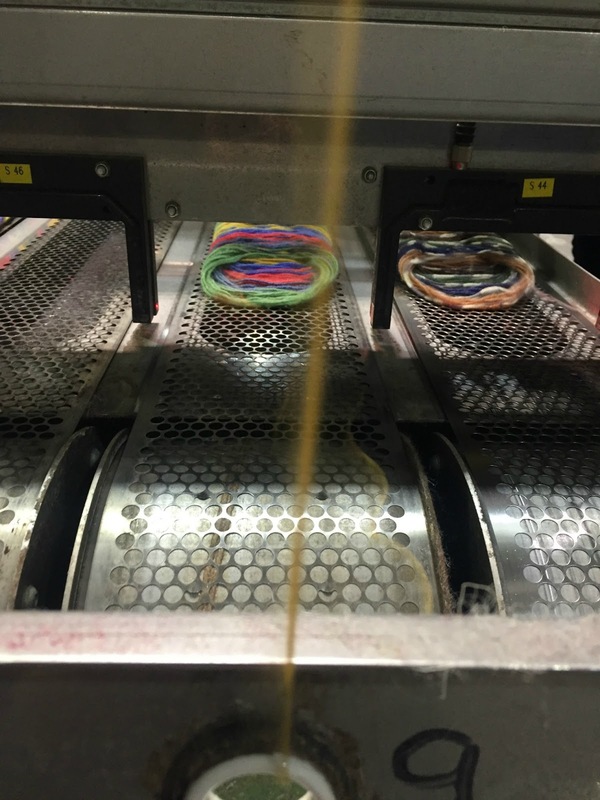 Once the tops have been pulled together into one big thick strand, it goes through the square part of this machine which combs the fibres into the same direction and it "pours" out of the tap at the other end of the machine ready for spinning. 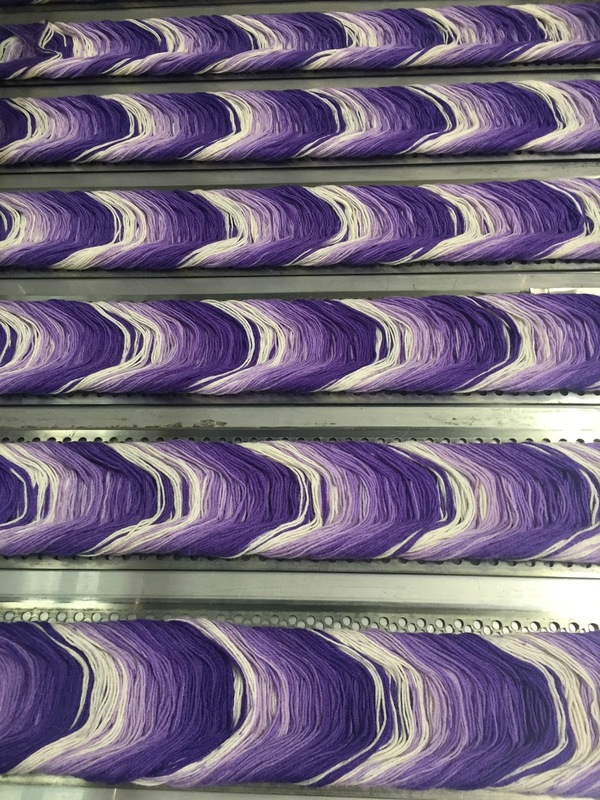 If you're interested in the process that the fleece goes through, you'll find it all in my mill visit blog post! 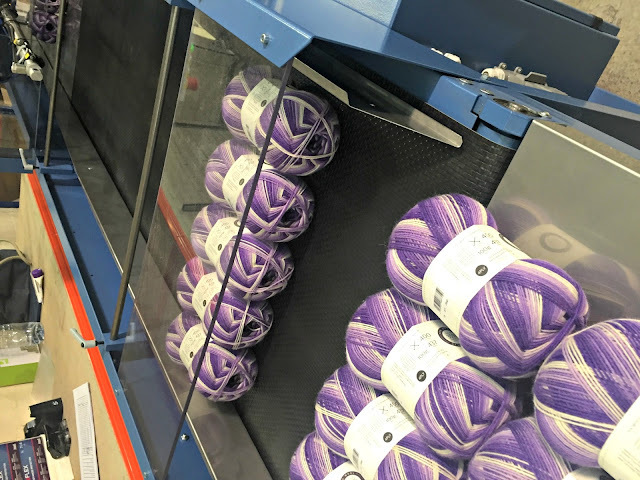 It may come as a surprise to you if you've been using WYS yarns for a while that they only started producing yarn under their own name in 2012. It feels as if they have been around for much longer than that! Peter and Richard Longbottom, the father and son team who run the mill, made the decision that they wanted combine British raw materials with state of the art technology and using their combined skills and extensive knowledge of spinning and the yarn industry, they took the market by storm. Nowadays, their range covers pretty much any weight of yarn you'd want to use from laceweight to chunky and comes in an amazing rainbow of colours. 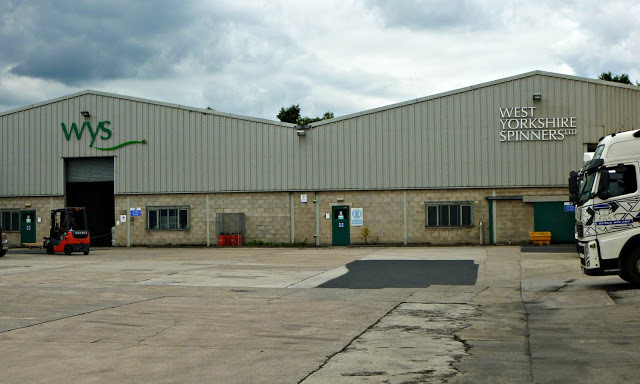 The West Yorkshire Spinners dye house is where the Colour Magic happens. It's all top secret as you'd expect, but Sarah has very kindly taken some photos for me so that we can see some of what happens. It's probably just as well that they didn't let me in as I'd have no doubt got in the way hopping up and down with excitement! Sarah's dye lab is right in the middle of the dye house so she can keep a close eye on what the dyeing machinery is doing. 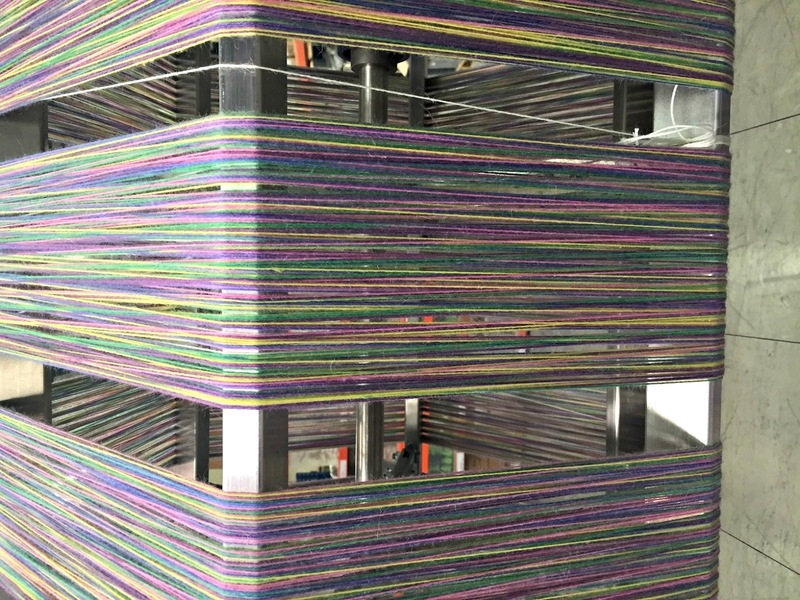 She has detailed records of every recipe that makes up each colour in the new yarns and also how much of each colour is to be used in every dye run. You'll have guessed from looking at the balls in my previous post that the Winwick Mum colours are going to knit up into stripes because I really love stripy socks (and especially matching stripy socks) and Sarah has created very special Winwick Mum stripes just for me which are quite different to the Country Birds and Cocktail colours you might have knitted before. It's really quite incredible what can be done with dyeing technology! Eek! Look at that! I feel quite giddy with excitement looking at all that Wildflower squishiness! 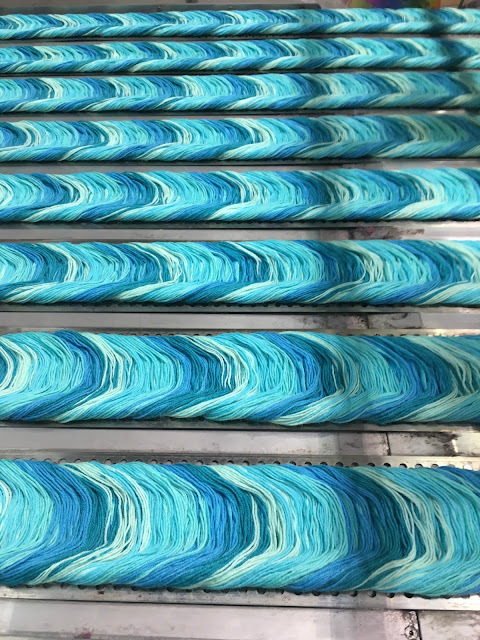 The last process before winding the yarn into balls is to fluff it up as the washing and drying leaves it rather flat. I'm sure there's a more technical term than "fluffing it up" but that's essentially what's happening here as the yarn travels down this conveyor belt whilst air is puffed up gently from underneath. It's quite mesmerising to see it all laid out like that, isn't it? A sea of Wildflowers! and Hidden Gem is so very purple that it makes me sigh with pure delight! Oh, how I adore these shades of purple! Can you see the yarn next to it on the right in the picture below? That's Mallard from the Country Birds range and it was this photo that really caught my breath. 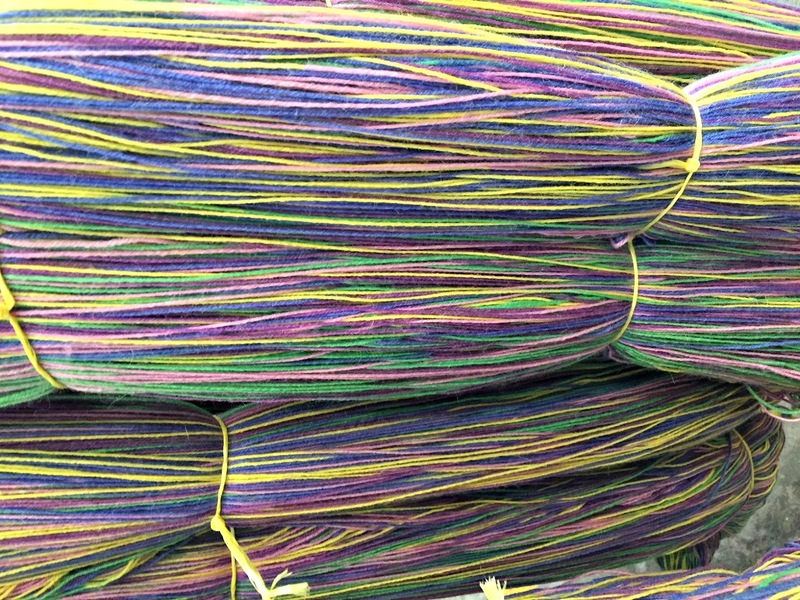 Those are my colours next to a hugely popular Signature 4ply colourway! 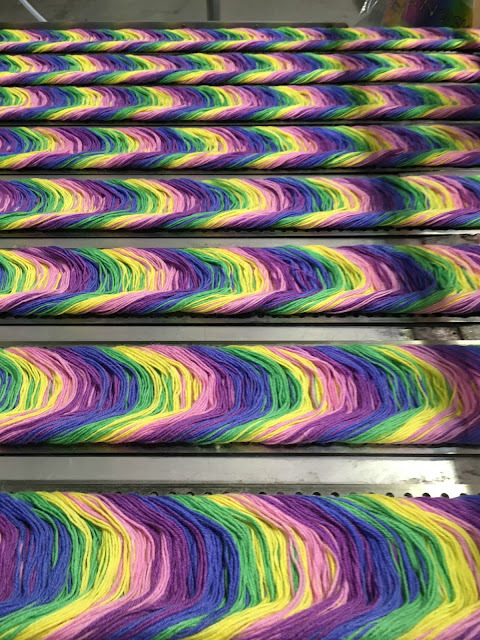 When I visited the mill back in 2016, I never imagined that I would ever see this photo, although it's around that time that I wrote my daydream list after seeing how the yarn was made first-hand. I feel that I should keep this photo on my desk forever to remind myself that daydreams and wish lists aren't something fanciful that we should dismiss as only ever happening to someone else, and that consistently working towards whatever it is that you dream about can only bring it closer. 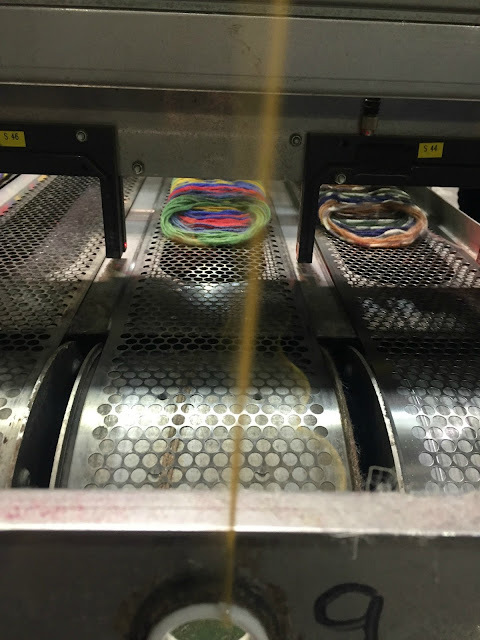 As is happening to this yarn: the conveyor belt brings it closer and closer, and that yellow streak that you can see is the same yarn being wound onto the ball. Getting closer - and still winding! Look! There's Hidden Gem as well! It does look pretty amazing with the Winwick Mum logo on the ball band. Big daughter's best friend designed my logo for me (she's a graphic designer) and it's been wonderful to be able to show her how her artwork has been reproduced on badges, on my patterns and now on yarn ball bands. 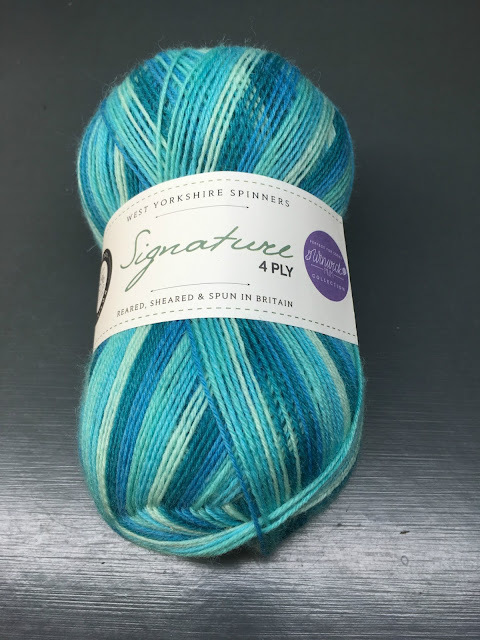 I love how it feels so much like a family effort: my Winwick Mum family with the West Yorkshire Spinners family - and I hope that these will make fabulous socks (yes, yes, or any other project, not just socks 😀) for your family too. I love how yarn connects us all. It's magic. This week has been one of those weeks of car insurance renewals, poking at blocked drains (I need to pick up some drain cover keys this morning which makes me feel very builder-like but also tells you that poking at a blocked drain doesn't always do the trick), and knitting. 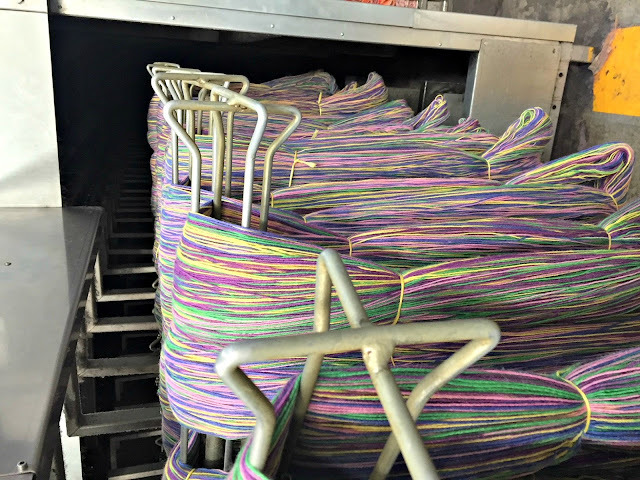 Lots of knitting! I went up to see Lucy in Skipton at the beginning of the week which was just lovely as always, and we chatted and chatted, and in the afternoon I knitted and chatted at the knit n natter group. 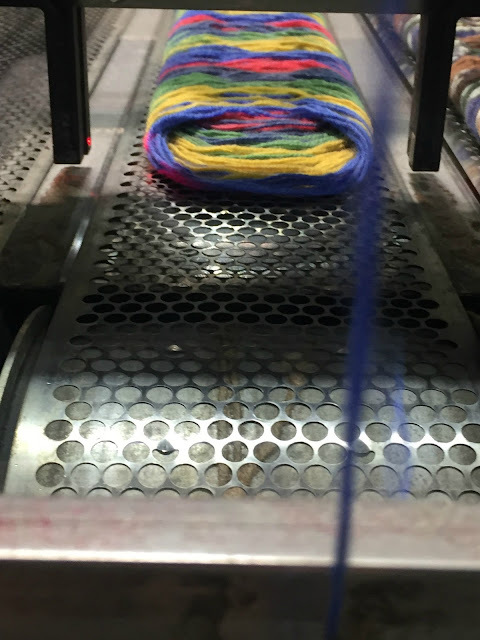 I thought I'd tell you a bit more about the colours of the yarn today, and where they came from. There are four shades in the collection (four! I'm surprised you couldn't see my grin from where you are when WYS said that's what they wanted! 😀) and I knew exactly what I wanted each of those four shades to be - although that's when I learnt that there's quite a difference from having colour shades in your head to being able to show someone else what you've got in mind! 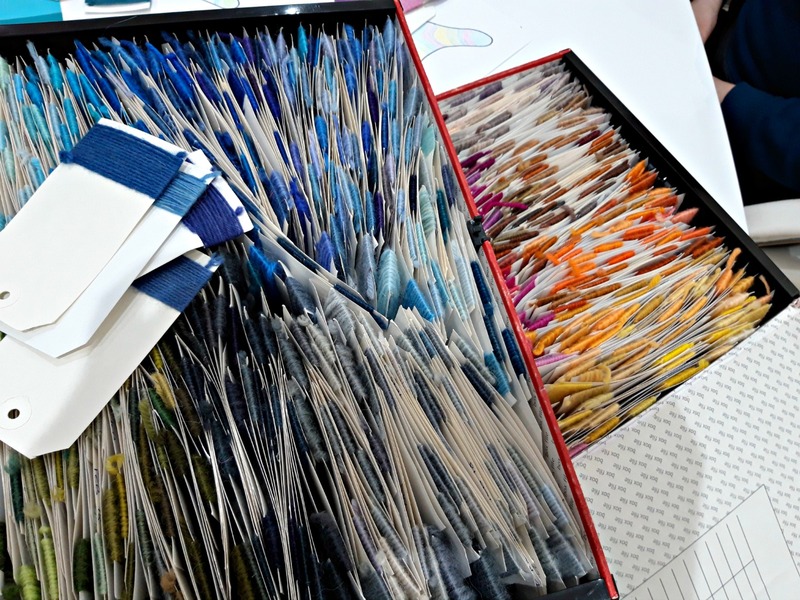 Luckily for me, Sarah the Colour Genius (seriously, that should really be her job title) at West Yorkshire Spinners has a magic box full of colours and also a magic ability to understand what's going on in my head - but more of that later. Look at all those colours! Don't you just want to riffle through them all? It's incredible to think that there are so many subtle nuances to each of the colours and I could have quite happily have played with those cards for some considerable time, but there was work to be done! We've had quite a lot of fog recently. I tend to associate fog with November rather than January but we've had more foggy days recently than not so maybe I'll have to review my association! When the weather's like this, it's always a bit of a gamble whether to take the dog for a lead walk where I know I'll have him safely attached or to go where I can let him off and hope that he doesn't disappear (this dog is a big hairy toddler even at the age of 7 and a half!). 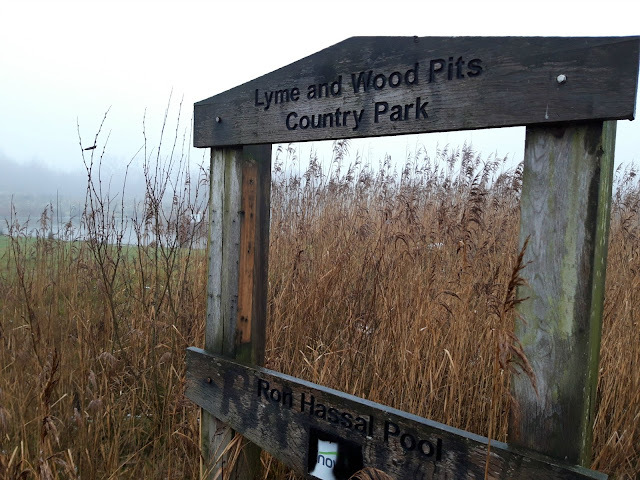 On this particular morning, although it was a very foggy drive to the Lyme and Wood Pits Country Park (I've written about this place a number of times before), by the time we got there it had lifted a little and just seemed to be foggy "around the edges".